CLAPHAM, England — The boy was 13 when a dawn immigration raid abruptly ended his father’s four-year quest for political asylum in Britain. By nightfall of that day in 2005, father and son were hundreds of miles from home, locked in the privately run Yarl’s Wood Immigration Removal Center here, scheduled for deportation to their native Angola in the morning. Instead, shortly after midnight, the despondent father, Manuel Bravo, 35, walked to a stairwell with a bed sheet and hanged himself. The note he left said why: so that his orphaned boy could stay in Britain. Indeed, the law did not allow immigration authorities to deport an orphan who had no one waiting for him. 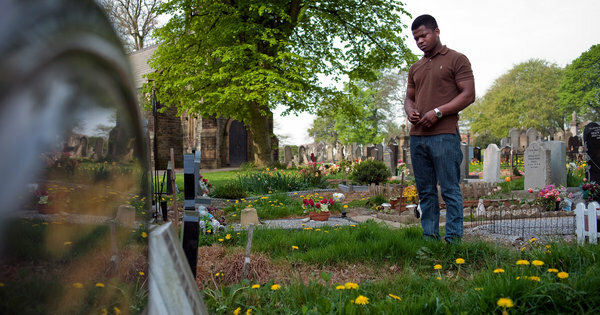 A British family the Bravos knew through church took the boy, Antonio, home to Armley, the working-class suburb of Leeds where they had settled in 2001. Antonio, now 19, is an apprentice electrician who aspires to be an engineer. Not far from his father’s hilltop grave, he shares a century-old house with five British roommates and regularly visits the family who raised him. “I want to make my dad proud and not feel like he gave his life away for no reason,” he said. But next month, Antonio faces the threat of deportation all over again. Under changing laws, instead of qualifying for citizenship this year, as he expected, he is not eligible to apply. His temporary residence permit, granted on humanitarian grounds, is expiring with no clear path to renewal. Antonio’s story is emblematic of one nation’s escalating efforts to repel unwanted migration, through an enforcement system partly run by private contractors. Like governments throughout the Western world, Britain’s has come under increasing pressure to increase expulsions, cut immigration and restrict citizenship. At stake for officials is “managed migration,” a way to maintain an influx of the most desirable settlers and genuine refugees by forcibly excluding the rejected — in an effort to rein in the hostility toward foreigners that is mounting from Australia and the United States to Norway and France. But some analysts contend that, on the contrary, the detention and deportation boom has legitimized treating foreigners as scapegoats, ratcheting up public anxieties and broader demands for restriction. Over the past decade, public targets of crackdowns have shifted from “bogus asylum-seekers” to “criminal aliens” and now to “unsustainable net immigration,” a term that includes perfectly legal settlers, noted Mary Bosworth, a criminologist at the University of Oxford who has tracked the expansion of immigration jails like Yarl’s Wood. And the rules keep changing. Last year Antonio passed a new “Britishness test” — What is a shadow cabinet? When is Mothering Sunday? — only to learn that it no longer counts in his case. “Great for a pub quiz, though,” he said. At first, the Bravos were a family of four: Mr. Bravo, calm and quiet; his spirited wife, Lidia; their son, Nelio, 3; and Mr. Bravo’s son, Antonio, 10, whose own mother died giving birth to him in Angola. In asylum papers, Mr. Bravo described himself as a farmer jailed and abused by the Angolan government because of his role in a pro-democracy party founded by his father. He fled for his life, he said, after security forces raided the family farm and killed his parents and sisters. Angola was then in the 27th year of a civil war. The Bravos requested asylum when they landed at Heathrow Airport in October 2001. Barred from work like most asylum-seekers in Britain, they were sent to Armley to await a decision. They found support at Christ Church from Catherine Beaumont, a volunteer at its immigrant help center, and the Rev. Alistair Kaye, then the vicar. But their application had joined a backlog just as the number of new asylum-seekers in Britain soared toward a peak of 84,000 a year in 2002. Public hostility soared, too, over revelations that few of those denied asylum ever left. The detention center, Yarl’s Wood, was then just opening, part of an expansion that the government and its private partners promised would triple the rate of expulsion. Instead, within three months, the $140 million center was gutted by fire during detainee protests over mistreatment. An inquiry by the prisons and probation ombudsman found in 2004 that it had been shoddily constructed and rushed into operation to meet “unattainable” Labour government targets before an election. Of 385 detainees the night of the fire, including 29 children and seven infants, only 46 had a deportation date, the government acknowledged in Parliament. By the middle of the decade, tighter border controls had cut asylum arrivals by two-thirds from the 2002 peak. But public hostility toward asylum-seekers kept rising, shaped by accusations that many were exploiting the public subsidies in a system that was slow to decide cases and ineffective at expulsion. The declaration fit a two-pronged strategy by Prime Minister Tony Blair, who was then opening doors to many immigrants, including computer specialists from Asia and people from the newest members of the European Union. Simultaneously, he showcased rigor toward rejected asylum-seekers, much as the Bush and Obama administrations highlighted record numbers of detainees and deportations while pursuing, albeit unsuccessfully, more lenient immigration laws. Mr. Bravo’s application was rejected in 2004, by a caseworker who cited insufficient evidence to support it. Mr. Bravo had no lawyer at the appeal hearing. “He was really demoralized,” Antonio said. “He felt useless.” The long wait for a decision led to conflicts in his father’s marriage, he added, and worsened his own difficult relationship with his stepmother. In fall 2004, the family split up. Taking Nelio, Mrs. Bravo returned to Angola to care for critically ill relatives. She was arrested and fled again, to Namibia, according to messages that trickled back. Mr. Bravo frantically tried to contact them, Mr. Kaye, the vicar, said, and did not live long enough to learn that she had reached Portugal, where she won asylum and dropped from sight. At dawn on Sept. 14, 2005, eight officers broke into the Bravos’ small row house. “I can’t get it out of my head,” Antonio said. “They bust in the door, shining lights. They handcuffed us both — I felt like a criminal, and I did nowt” — nothing, in the dialect of northern England. Later, in a report on the Bravo case, the ombudsman for prisons questioned the need for such a “robust exercise of state power” after long inaction, calling it “frankly cruel.” But the raid followed standard policy, he concluded, and had been planned down to details like giving Antonio’s five pet fish to a neighbor. Nor was protocol breached by the subcontractors who loaded father and son into a caged van. The Bravos had entered the world of outsourced immigration enforcement. In effect, they were in the custody of the Anglo-Danish company now known as G4S. Its guards drove them past the brick villas and open fields of Bedfordshire to an old military base where the Yarl’s Wood detention center, developed by the company in 2001, lies behind barbed wire. Contractors now run 7 of Britain’s 11 immigration detention centers, where capacity has grown 75 percent since 2001. Mr. Bravo’s one day in custody is documented in rare detail in inquest records. What still haunts Antonio is the moment when G4S transport guards discovered a brand-new clothesline in his father’s bag. They took the rope from Mr. Bravo, who was under treatment for depression, but never alerted Yarl’s Wood. G4S declined to comment for this article on its operations, either in general or with regard to the Bravo case. A nurse at Yarl’s Wood, employed by another subcontractor, confiscated Mr. Bravo’s antidepressants and did not ask if he was suicidal — for fear, she testified, of putting the idea in his head. Official inquiries concluded that these lapses made no difference. Father and son were escorted through eight locked doors to their room, where Antonio waited while Mr. Bravo made last-ditch phone calls. Antonio was sleeping when security cameras recorded his father’s suicide. The ombudsman’s 2006 report complains that for hours no one accepted responsibility for waking the boy to tell him his father was dead, and later, no one explained that he would not be deported alone. The staff members refused to let him go, invoking his best interest. Last fall, after work on a rainy night, Antonio led a visitor to the home where he finished out his childhood. The dog went wild with excitement. In the parlor, beside a glowing hearth, Ms. Beaumont teasingly recalled milestones of his assimilation: feeding pigeons on a day trip to London, climbing a steep hill on a family bicycling holiday in Devon, sulking through a cream tea afterward. “I think you wished you’d never come to live with the family at that point,” she said. Mr. Kaye, who calls Antonio “a wonderful lad,” hints at the rougher patches now masked by dry humor. “They’re the ones who had to cope with all the teenage years, the grief and hard times,” he said. Despite efforts by London lawyers, Antonio’s asylum application was rejected in 2006 because the authorities had already rejected his father’s political claim. But he received a five-year grant of humanitarian protection, which at the time could lead to citizenship. His English took on Yorkshire rhythms; he forgot Portuguese. When his foster care subsidy ended at 18, he was earning his way as an apprentice electrician, at ease as the only black man on the crew, saving up for citizenship fees and university. But while Antonio tried to become British, British concerns about immigration were growing. A study for the Washington-based Migration Policy Institute, drawing on years of public opinion research, shows that even before the economic crisis nearly 7 of 10 Britons felt the country had too many immigrants. In the recession, attitudes hardened over perceived unfair competition for public services and jobs, and fears of Britain being “swamped” by foreigners. While 10 percent of Britain’s population was born abroad — fewer than in France or Germany — most people believed the figure was 25 percent. One political response was an overhaul of citizenship law that broke the links between temporary residence and settlement. Antonio’s decade in Britain, marred by nine months of illegal status as a child, is no longer sufficient to apply to stay indefinitely. He lacks British relatives or exceptional skills, other avenues to naturalization. His permission to stay expires Sept. 18. In his category — humanitarian protection — he must wait until 28 days before that date to apply for an extension, and somehow show that his need for protection has not changed. Meanwhile, the Conservative-Liberal Democrat coalition government has pledged to halve net immigration, now about 200,000 people a year. Since it cannot curb arrivals from the European Union, that means pushing harder to reject non-Europeans. For Antonio, there is a personal twist: Nelio, 13, came back to Britain on his Portuguese, or European Union, passport. Antonio’s former stepmother, who had remarried — and did not respond to a reporter’s e-mail messages — had sent Nelio to be raised by Portuguese friends near Manchester. She has returned to Angola, now a country at peace that is alien to Antonio. Reprinted from The New York Times, International, of Sunday, August 21, 2011.